to present a $75 gift certificate give-away! Having God’s Word on your walls can help you and your family keep Him in the forefront of your minds every day. For nearly 10 years WiseDecor has seen the body of believers come through and order our scripture wall decals and various Bible verses to encourage their families, communicate romance to their spouse , and welcome members and visitors to their churches. 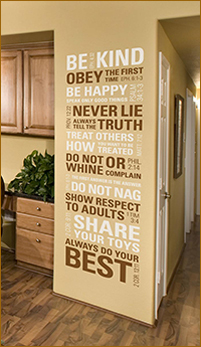 We recently created a new Bible-based House Rules wall decal that can serve as a reminder to your children of God-given guidelines for behavior in your home. God calls on His children to boldly proclaim His name, so one of our most popular verses is from Joshua’s bold proclamation to his people: “As for me and my house, we will serve the Lord.” – Joshua 24:15 , for which we have several designs. To enter the give-away complete one or more of the options below. The winner will be picked August 4th. The winner will be contacted via email and given a gift certificate code worth $75 which can be used to purchase any item on WiseDecor. What a great addition to our home this would be! This is so perfect for ALL homes! If we don't ein, is there a place to purchase? Thank you for this awesome giveaway! I had Scripture up on my walls at our last house in Kansas, but since we moved out of state I haven't put new ones up. I LOVE this!! Hoping I win! If not, I will be making a purchase– soon! Thanks for the give-a-way! I love this idea. Considering it for my classroom. This would be fan great way of reminding adults and teaching children "precious".